On my last book buying binge, one of my favourite booksellers (hi Steph!) recommended a few books that hadn’t been on my radar. One of her suggestions was a non-fiction book called A WALK IN THE WOODS. I'd never heard of Bill Bryson before, which slightly horrified Steph, so she started the hard sell. "He just woke up one day and decided to hike the entire Appalachian trail!" she said, with a wide smile and chuckle. The twinkle in Steph's eyes was undeniable and she'd clearly loved it because she and another employee put a big STAFF PICK sticker on the cover, so I added it to my pile. And just like every other one of Steph's recs, it was awesome! The synopsis, courtesy of Goodreads. The majority of the non-fiction I read is comedic, and Steph’s description of the quirky nature of Bill Bryson’s writing was bang on. I don’t think that I’ve ever read a such a fact-filled work of non-fiction without being bored to tears—a relative triumph, in my opinion. 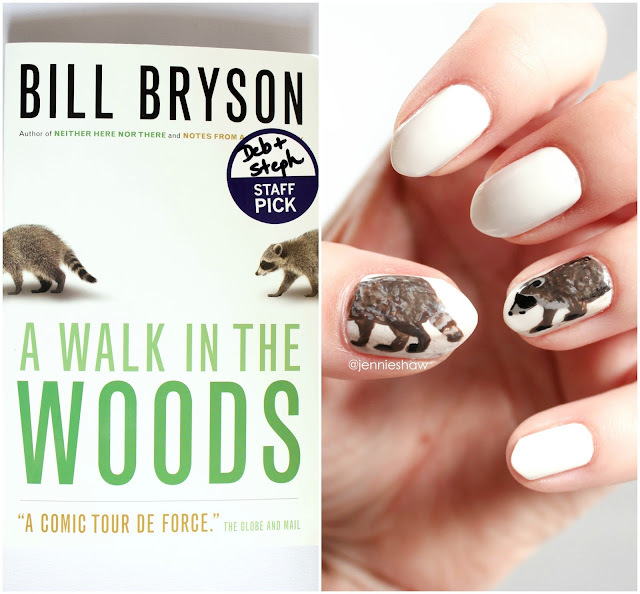 Because Bill Bryson loves facts, guys and gals. He loves them hard. But he's also funny. Very, very funny. It's an excellent combination. 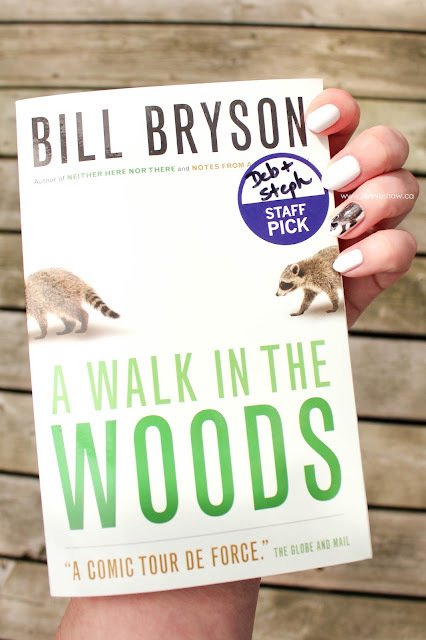 So if the book was simply Bill's take on hiking the trail, it would probably still be entertaining, but there's more than just facts, a long hike, and comedy delivery in A WALK IN THE WOODS, and his name is Katz. Oh Katz. He's just the best! After Bill sent out invitations via his wife's Christmas card mailing, only one person responded with interest in joining his hike along the Appalachian trail: Katz, an old friend who Bill had traveled in Europe with, when they were in their early twenties. And so the two of them set out, albeit it with much different equipment (higher quality camping gear for Bill and several packages of Little Debbie cakes for Katz--one of the reasons I loved him!). As you can probably guess, this is where the comedy begins in earnest, because two middle-aged, inexperienced men in the wilderness is bound to be funny. You know, as long as it doesn't end with one being eaten by a bear or something. And speaking of bears, that was one of the first times I laughed out loud, when Bill recounted information he learned from a book titled: Bear Attacks: Their Causes and Avoidance. Good grief, was that a funny section. Haha! 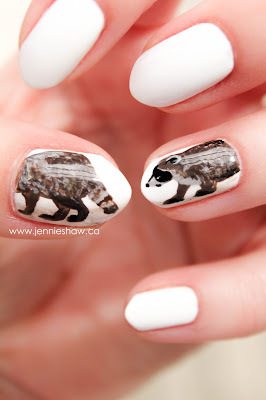 For my tribute mani, I tried to recreate the walking raccoon. Yes, there's one leg too many, and props to you if you noticed before reading this caption. I didn't realize it until I started editing the photos. Haha! The polishes I used were ORLY's White Tips, OPI's You Don't Know Jacques, Julep's Rooney, China Glaze's Change Your Altitude, Fingerpaints' Black Expressionism, and Black Rite Stripe. That's why the book works so well. On one hand, there's Bill, the by-the-book hike leader-slash-travel-writer, while on the other hand, there's good ole Katz. An everyman kind of person, if you will. Their different takes on their journey are what makes the story so engaging. And when Katz loses his mind (which happens a handful of times) I laughed out loud. The best way to describe those moments is that Katz said aloud what all of us were thinking, Bill included. Haha! It's amazing to me how different lighting can alter polish colours. This shot is inside a lightbox, with indoor light. The other two pictures were taken outside, and consequently look much darker. So if you're in the market for a fun, informative read about an area of the United States that most don't know much about, then I highly recommend A WALK IN THE WOODS. And if you like the sounds of the book but don't want to read it, you're in luck because there's a movie currently playing, starring Robert Redford and Nick Nolte (I'll leave it to you to suss out which actor plays which role, haha!). I always enjoy reading your book reviews. Also you nailed the manicure.